Plano eleventh-grader Caitlin Savage is this year's best of show winner in Dallas Area Rapid Transit's (DART) annual student art contest. Her work was selected from first- through third-place finishers for each grade level in the contest, which attracted 2,246 entries from students in kindergarten through 12th grade. 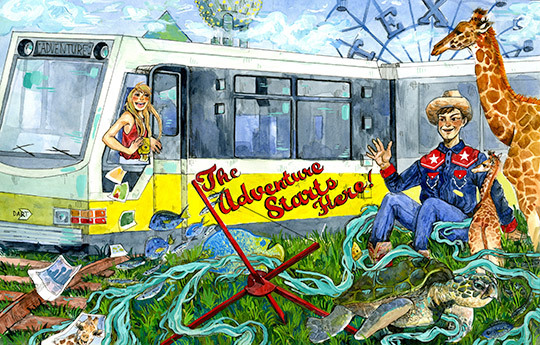 DART's 2017 art theme was "The adventure starts here." Savage is enrolled in the Plano Independent School District at Plano East Senior High School. She will receive a $1,000 cash prize by Dallas Contemporary and her winning art will be displayed on the side of a DART bus traveling across the agency's 13-city service area through September. The winning entry along with 28 various grade-level first, second, third place and honorable mention winners can be seen at DART.org/artcontest and on display at the Dallas Museum of Art from Apr. 18-30 before being highlighted at Dallas Love Field. DART's student art contest is a 19-year tradition that helps promote the use of public transportation and is supported by community partners Dallas Contemporary, Half Price Books, Perot Museum of Nature and Science, Dallas Zoo and the DMA, along with media partners The Dallas Morning News, Al Dia, NBC-DFW, Telemundo-39 and Suburban Parent Magazines.